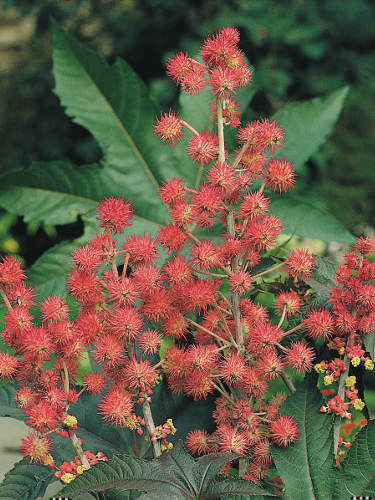 A showy form of the venerable castor bean long used in medicine. Has large maroon leaves, red stems, and spiky red seedpods. Oil extracted from the seeds of the green form is a commonly used laxative for temporary constipation and acute diarrhea. Large tropical-looking foliage. Can reach as high as 150cm/60in. Caution: The seed oil is safe but the raw seeds are poisonous.